Looking for Gadla hire or Mehndi mattress hire in London, then you have come to the right place. We have excellent quality floor mattresses creating a comfortable floor seating option. Our floor mattresses are very popular for use on Mehndi night, sangeet night and Vidhi ceremonies. Why do I need a Gadla or Mehndi Mattress? 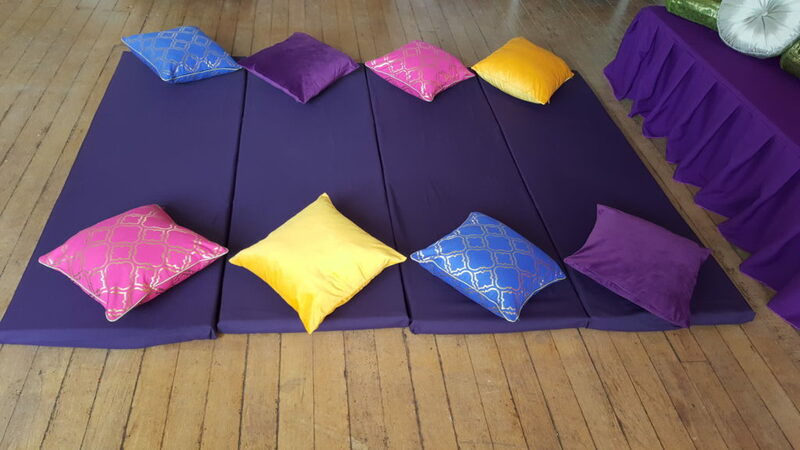 If you are having any function which requires your guests to sit on the floor, then these mattresses are essential. We don’t use cheap soft foam, our mattresses are excellent quality and suitable for hours of comfortable seating. They are great if you are having a mehndi or sangeet night where typical people sit on the floor whether it be in a Hall, in your marquee or your home. We have transformed many homes to create a seating area. These look great in your living room and are especially popular for those who have wooden flooring. They are also great for a Vidhi service which you may be doing at home or a small function hall. Many people have the Mehndi and Vidhi ceremony close together so our Gadla’s can be fully utilised for both occasions. Mehndi mattresses come in a range of colours. Our current most popular combination are Pink and Purple. Also a common choice is to have this mix on the mehndi night and then to cover the mattresses in a white fabric for other ceremonies such as a Vidhi ceremony. Of course you can stick to the same colours for both but the choice is there. We can also add more style by adding bolster cushions and mehndi cushions creating an amazing look for your party. With prices starting from £90 for 4 mattresses and 8 cushions, additional mattresses for £10 each and cushions for £2 each we can create a great package for you. Contact us now for mehndi mattress and Gadhla hire in London.